Google wants to provide people with easy access to actionable information in times of crisis. The internet giant is launching a new feature to help netizens promptly and effortlessly figure out how they can stay safe when natural disaster strikes. The so-called SOS Alerts initiative will introduce numerous help tools to Search and Maps. Designed to keep users safe, the new addition will display top stories, authoritative local information, emergency hotlines and websites, as well as various translations of useful phrases and terms. Users in close vicinity to affected areas might also receive notifications on their mobile devices that direct them to the same information. The new functionality will also make it easier for unaffected users to find relevant information in times of crisis. Searches for affected events or locations will now pull up SOS Alerts that provide timely overview of the situation as well as opportunities to show your support with donations. Maps will be updated with similar features too. The popular navigation service will be updated to show tappable cards with helpful information, as well as frequent updates to reflect road closures and traffic congestions. To offer such detailed reports in real-time, The Big G has partnered with several emergency help agencies including high-profile institutions like the Red Cross and the Federal Emergency Management Agency. 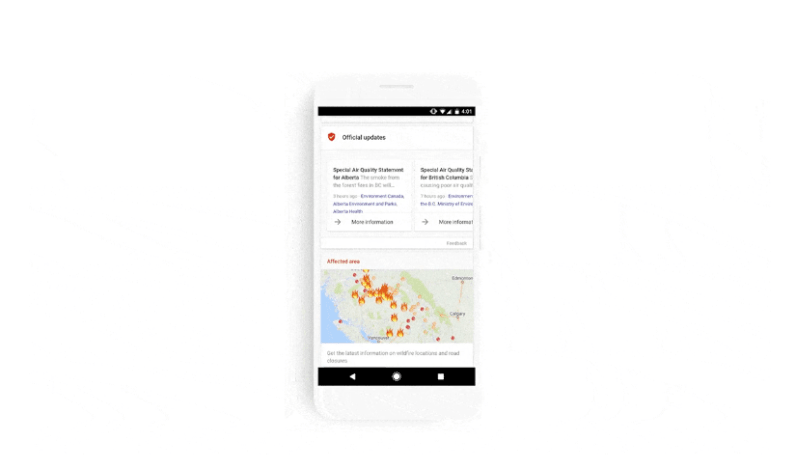 With the introduction of SOS Alerts, Google now has four products in its existing line of emergency tech, which so far includes apps like Person Finder, Crisis Map and Public Alerts. The Mountain View heavyweight is hardly the only company seeking to use technology to create a safer community. Facebook has long been working on its own emergency features with the Safety Check functionality. Hopefully though, Google’s solution does a better job of targeting real victims of disaster than Facebook’s.